Since 2004 I've been using the public forum as my primary venue for my artistic investigations. I was always interested in the city and people so I decided to work in public were I could study these monsters first hand. it made sense to immerse my self deep in the I started my urban experiments by painting renegade graffiti murals, exhibiting at large scale outdoor public festivals and working as a full time street performer in the city of Toronto. The best part of being a public artist is the random encounters and chance occurrences which can only happen while roaming the city streets. As a result of this process I have met thousands of people from all over the world and of all walks of life. 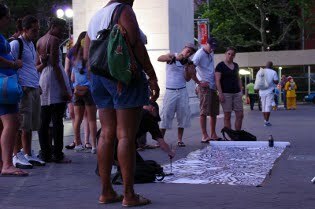 My sidewalk art performances generally consist of large spontaneous paintings of the city, people and the strangeness of existence in general. The murals feature an imaginary “City of Gears” and emphasize the interrelationships which exist between the individual and the metropolis. 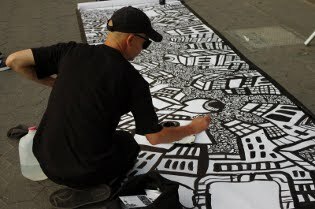 Although my earliest street drawings were just small sketches by 2007 I was making 15 x 15 foot murals in a single afternoon. After four years of constant experimentation including interventions, gala performances and storefront displays I decided to start travelling with the performance. Of the new places I have visited my favorite one is Washington Square Park. 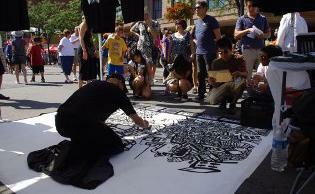 The park is famous for hosting spontaneous performances and has a long history with street art. I must say that despite a changing world the park hasn’t changed all that much. There were painters, dancers, gymnastics and jazz players everywhere. The crowds were incredible and the energy was extreme. The circular fountain is like a vortex inviting people from all over the world to come and participate, even the spectators are part of the show whether they like it or not, absolutely everyone gets involved. I have to say that it is the most fun place to paint that I could possibly imagine; nothing can compare to the sound of a child’s thick Brooklyn accent cheering on your performance while you work under the arch!